You don't need to bust the budget to get your work done. We evaluate four Windows laptops that cost about $US600 or less. Every day an army of business people heads out to offices, meetings and coffee shops, equipped with little more than a smartphone and a laptop. To get the job done, that laptop has to be secure enough to protect sensitive data, rugged enough to bounce around in a backpack, and with enough battery power and performance strength to get through a day of presentations, emails and online chats. All without busting the company budget. Welcome to the world of mid-priced Windows laptops. According to Linn Huang, research director for devices & displays at IDC, today's typical business systems are far from the high-end, high-cost ultraportables and 2-in-1s that usually get media attention. More basic and functional than typical consumer systems, business notebooks tend to do the basics well and have few amenities, such as HD screens or solid-state storage, Huang explains. The typical business laptop is powered by an Intel Core i3 or i5 processor and has 4GB of RAM, a 500GB hard drive and a 15.6-in. display, at an average cost of $US614. They are generally a rugged bunch, although some go an extra step with military-level endurance and others add spill-resistant keyboards. Plus, because security is key in the enterprise, some of these mobile machines have a Trusted Platform Module (TPM) chip that can make remote access more secure. Finally, because there are still a number of businesses out there that have not yet moved to Windows 10, these systems still offer a choice of Windows 7, 8.1 or 10. They were all loaded with Windows 10 when reviewed. At the end of the article, you can also read my conclusions, find out the specifics of how I tested, and see comparative tables of the features and test results for these four laptops. If you need lots of connections and reasonable battery life on a tight budget, the AsusPro P2520LA should be in your bag. The AsusPro, $530 (starting retail price), measures 14.9 x 10.0 x 1.0, with a rather large battery that causes the back of the system to go to 1.4 in. thick. 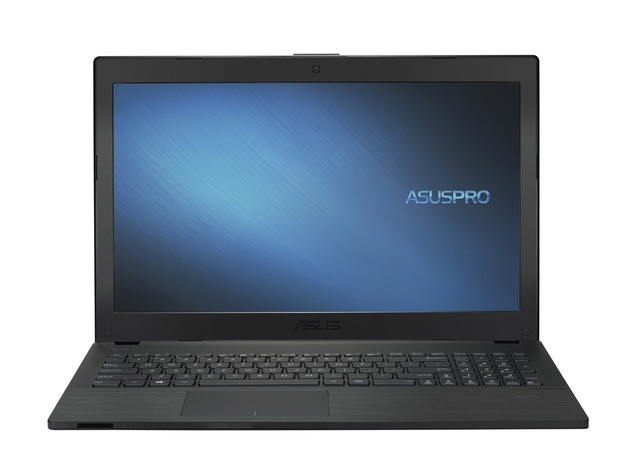 At 4.9 lbs., the AsusPro is an ounce lighter than the Toshiba and HP systems. When you add the three-prong AC adapter, however, this increases to a travel weight of 5.5 lbs. The AsusPro has a straightforward all-black look with a striated plastic case. Its keys measure a generous 18.9mm, but their depth is shallow at only 1mm, and they didn't have enough travel and feedback for my tastes. Like the Toshiba and HP systems, the AsusPro includes an optical drive and both VGA and HDMI ports for video. It adds three USB 3.0 ports that those who use high-speed peripherals like external hard drives will appreciate. There's also a single USB 2.0 port. Its 15.6-in. 1366 x 768 display matches the others in resolution, but it was the dimmest of the four, with a brightness reading of 182 candelas per square meter. The screen looked visibly duller than the HP's in side-by-side viewing. In addition, I wasn't that taken with its audio, which sounded muted because the speakers are underneath the system, directed down. As far as security goes, the AsusPro doesn't have two features that many business systems offer: a TPM chip for making secure remote access easier, and the ability to run only BIOS software that is approved by the manufacturer. Equipped with a fifth-generation Core i3 processor, the AsusPro is step behind the Dell and HP laptops, which sport gen-six Core i3 and Core i5 processors, respectively. Like the others, it has 4GB of RAM and 500GB of storage, but rather than a 7,200rpm hard drive, it uses a slower 5,400rpm hard drive, which cuts into its performance. Its Cinebench scores reflected these specs, with the ability to display 23.19 frames per second (fps) and a processor rating of 208, putting it on a par with the Toshiba (which has the same processor). The AsusPro did a bit better on the PCMark 8 test, scoring 2,426, which put it between the faster HP and the slower Toshiba. Its 2,560mAh removable battery scored a runtime of 4 hours and 24 minutes when being constantly used, an acceptable result for this class of system. The AsusPro came with the Asus Business Manager, an application that provides links to the various Asus tools -- nothing that any knowledgeable user couldn't do, but it's a quick and convenient way to access features like recovery, performance schemes, and various security apps. While the AsusPro is a nice example of an inexpensive system, in the end, the performance hit and lack of security features means that, unless you're really on a budget, you may want to invest in a slightly more up-to-the-mark laptop. 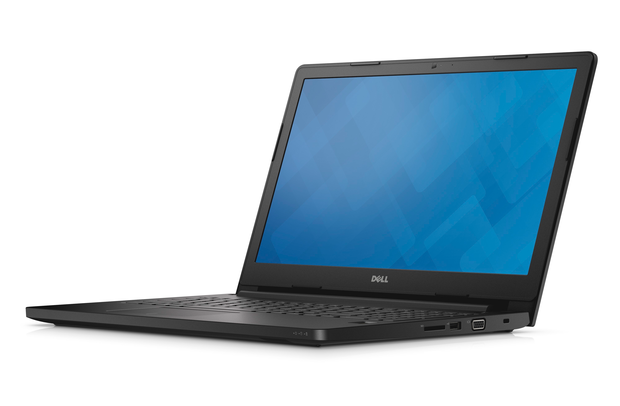 A competent system that excels at performance, the Dell Latitude 15 3570 uses the latest Intel processor. However, its battery life may leave road warriors searching for an AC outlet to charge up. The model 3570 (which is part of its Latitude 15 3000 line of laptops) retails for $553 (Amazon price). It's approximately the same size and weight of the others in this group of four business laptops with dimensions of 14.9 x 10.1 x 1.0 in. The battery raises the thickness in the back to 1.2 in. The system weighs in at 4.9 lbs., an ounce lighter than the Toshiba or HP. With its small three-prong AC adapter, the Dell has a travel weight of 5.2 lbs., tying with the Toshiba as the easiest to travel with. The Dell sports a smooth black plastic case, which makes it a bit more difficult to grip than the HP ProBook. Unlike the other three, it lacks an optical drive. The Dell's keyboard has 18.6mm keys with a generous 1.8mm depth, making them quite comfortable to type with. The system doesn't support the ability to run only approved BIOS software and lacks a Trusted Platform Module. Dell does provide a year of its Protected Workspace service that provides encrypted connections; it requires software on the server side as well. There's a VGA and an HDMI port as well as two USB 2.0 and two USB 3.0 ports. Although the display lid squeaked annoyingly when flexed, the system's 15.6-in. display was perfectly adequate -- fine for reading text in a document but lacking the vividness of the HP's screen. At 184 candelas per square meter, it was middle of the pack in terms of brightness. Unfortunately, as was the case with the Asus system, the Dell has its speakers placed under the system, resulting in muffled audio. Inside the Dell Latitude is a sixth-generation 6100U Core i3 processor that runs at 2.3GHz. That puts it between the higher-performance Core i5 CPU on the HP and the slower and older Core i3 CPUs on the Asus and Toshiba systems. The Dell comes with 4GB of RAM and a 500GB 7,200rpm hard drive. It was no surprise that the Dell came in second place in our range of benchmarks, behind the Core i5-powered HP ProBook, with a PCMark 8 score of 2,658 and Cinebench scores of 29.55 fps and 245 for graphics and processor tasks. With a 2,700mAh removable battery pack, the Dell was able to run for just 3 hours and 23 minutes on a charge. This is about two-thirds the time that the Toshiba lasted; not something you'd want to take on a long flight. The Dell is augmented with the company's Dell Data Protection heuristic technology that monitors the system's behavior looking for the telltale signs of an attack. I really liked Dell's Power Manager app, which squeezes every last electron out of the battery pack and checks on its health. All told, the Latitude 15 3000 is a competent performer. Too bad it lacks the battery life and security that business buyers look for.